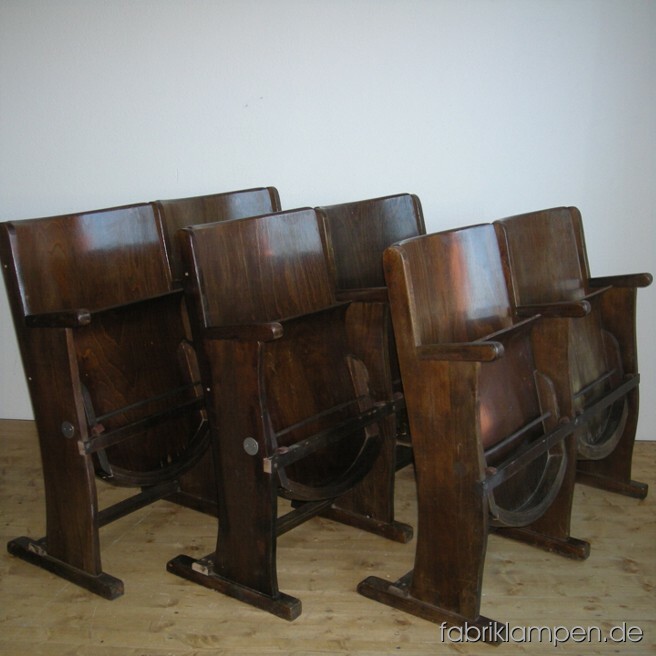 Old cinema chairs in very nice condition, made of beech and plywood. Rare single seats, individual usable. From about 1930. Width ca. 57 cm (22,4 inches), height ca. 84 cm (33 inches), sitting height 39-46 cm (15,3-18 inches). Nice patina, cleaned and conserved. 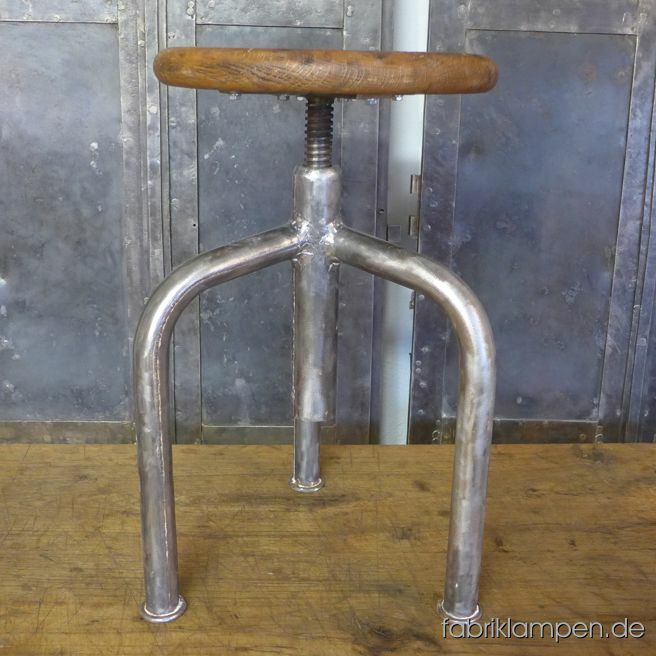 Very nice old industrial stool with oak sit. From about 1920. The pedestal is cleaned and conserved. With original oak sit, waxed. The oak massive sit is 4,5 cm (1,8 inches) thick, the diameter amounts to 29 cm (11,4 inches). Everlasting, suitable for gastronomy or for your loft-kitchen. Or as guitar stool for example. Sitting height from 49 to 72 cm. 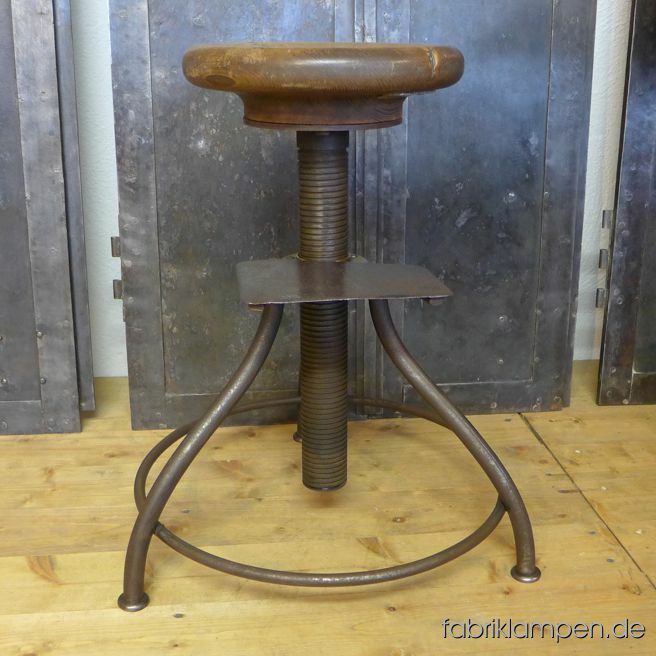 Very nice old industrial stool with oak sit. From about 1950. The pedestal is cleaned and conserved (here and there with remains of original white colour). The oak sit is waxed. The oak massive sit is 3,5 cm (1,4 inches) thick, the diameter amounts to 32 cm (12,6 inches). Everlasting, suitable for gastronomy or for your loft-kitchen. Sitting height from 48 to 69 cm. 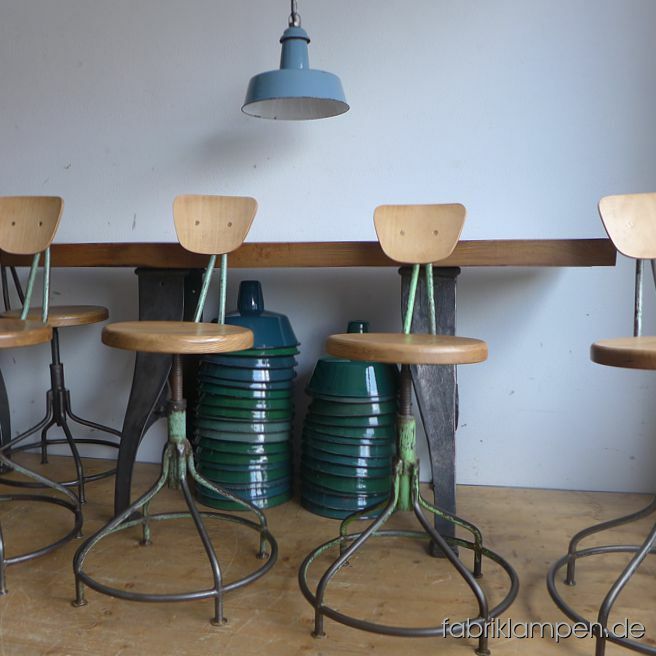 Nice old industrial chairs from about 1950-1960. The pedestals are cleaned and conserved. Everlasting, suitable for gastronomy or for your loft-kitchen. Gray chair with oak sit and backrest. 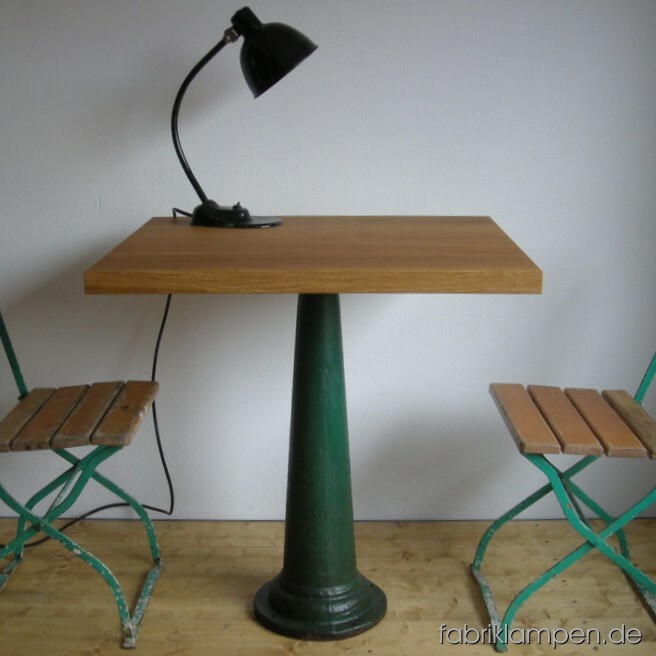 Green chair with steel sit and plywood backrest. 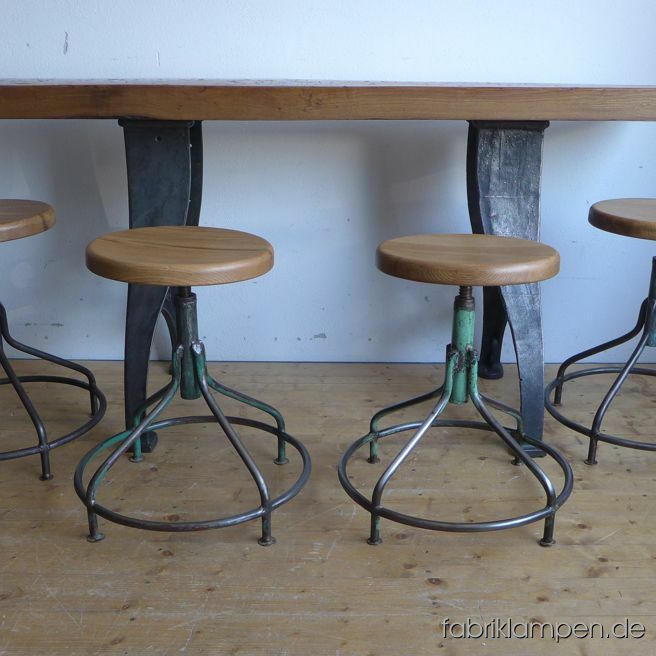 Very nice old industrial chairs with oak sits. From about 1930-1940. The pedestals are cleaned and conserved (here and there with remains of original colour like green or gray). Please see these chairs in original condition as found on the last photo. These old chairs became new oak sits, they are waxed. The oak massive sits are 3,8 cm (1,5 inches) thick, their diameter amount to 35 cm (13,8 inches). 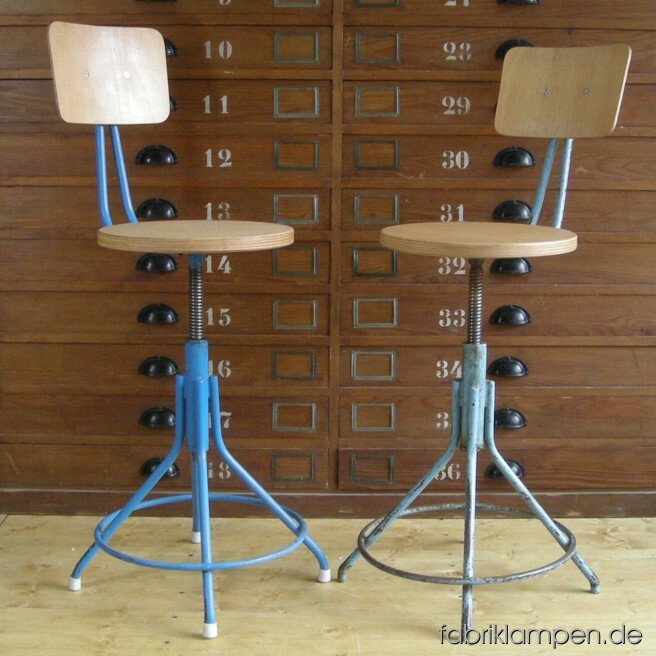 The backrests are made of upcycled old plywood and mounted with brass screws. Everlasting, suitable for gastronomy or for your loft-kitchen. Sitting height from 51 to 65 cm. 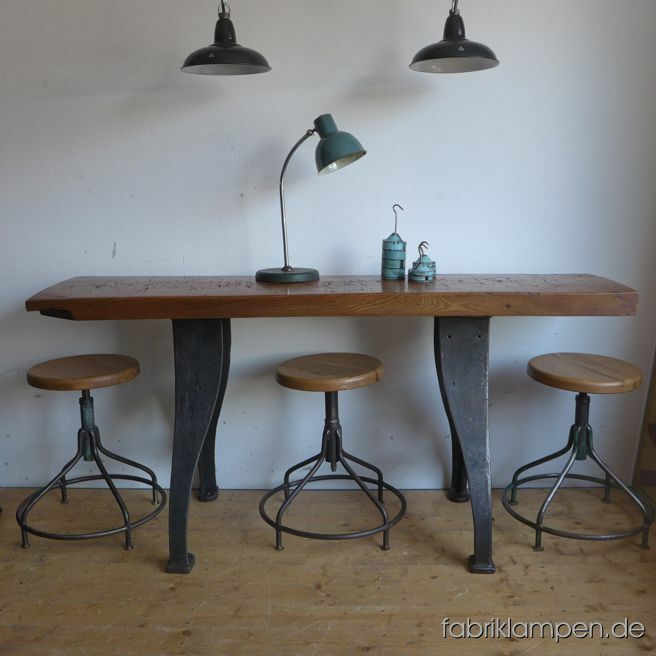 Old industrial table (workbench), restored. The casted iron pedestals are cleaned and waxed. Very fat and heavy tabletop (ash massiv, made of one piece of wood) with nice traces of use on the surface. Perfectly cleaned and waxed. Height: …. cm, Tabletop: 174 cm x 41,5 cm x 7 cm (lenght x depth x thicknesss), Width of the pedestal at the bottom: 59 cm. 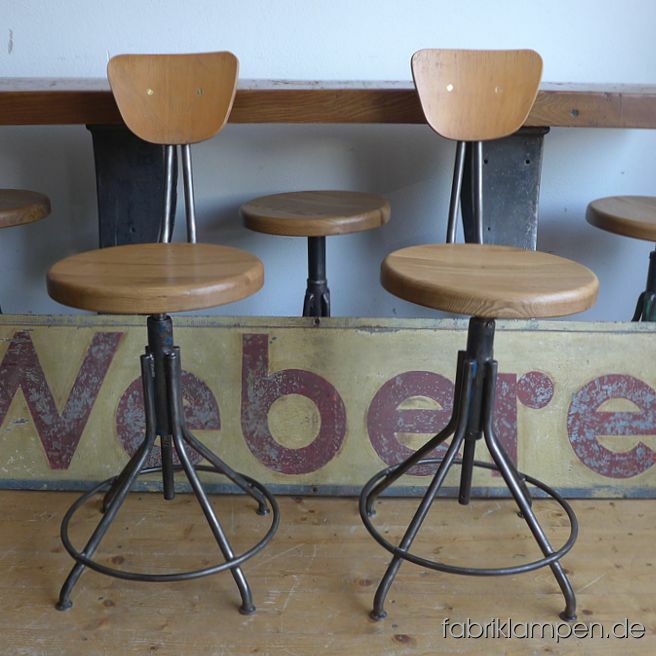 Very nice old industrial stools with oak sits. The pedestals are cleaned and conserved (here and there with remains of original colour like blue or green). 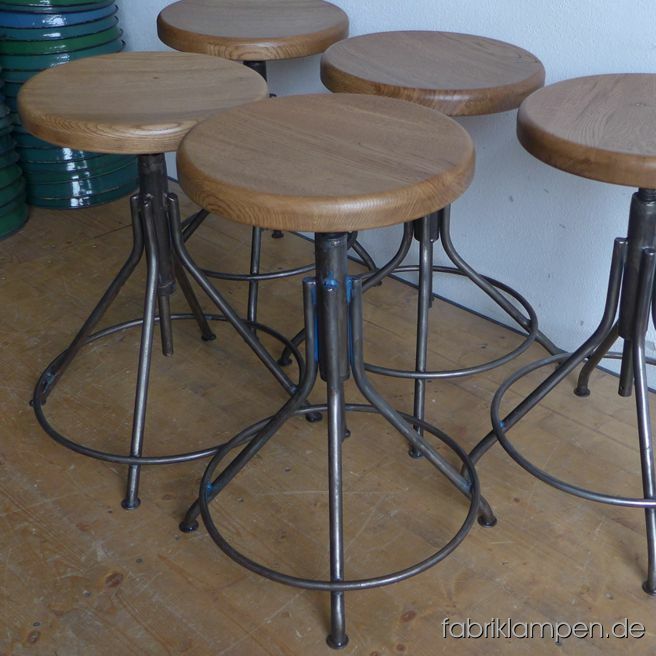 These old stools became new oak sits, they are waxed. The oak massive sits are 3,8 cm (1,5 inches) thick, their diameter amount to 35 cm (13,8 inches). Everlasting, suitable for gastronomy or for your loft-kitchen. 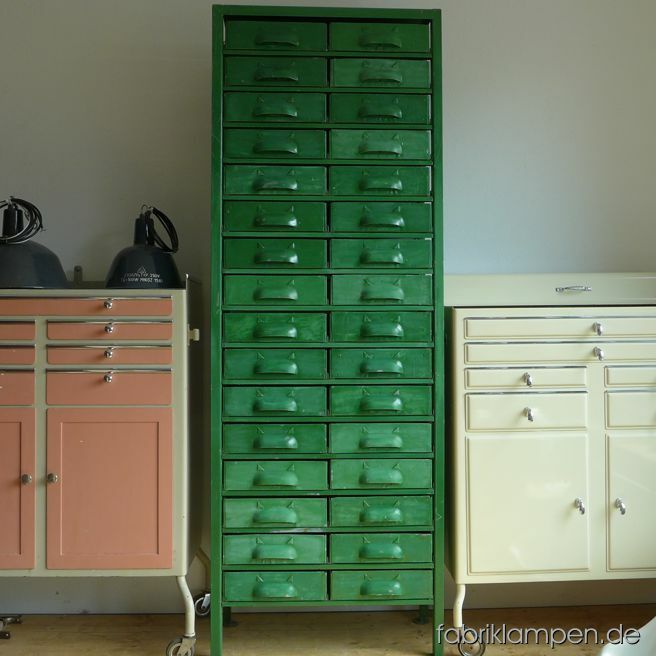 Old workshop cabinet with 36 drawers, emeraldgreen. Good original condition, nice patina. Height 186 cm (73 inches), width 67 cm (26,4 inches). 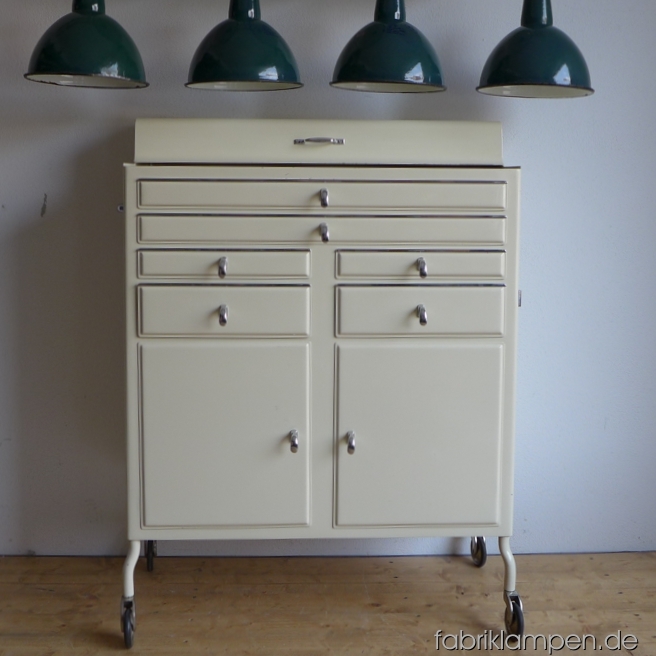 Nice old medical cabinet (from a dentist). Very good original condition. 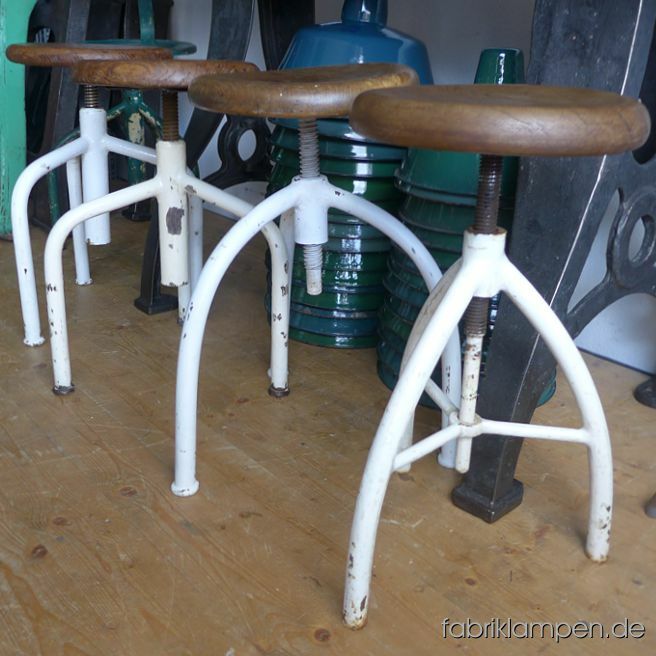 Nice old industrial stools. The pedestals are in nice original condition, the sits are restored (sanded and sealed with silky matt transparent varnish). Diameter sits ca. 36 cm (14,2 inches), sitting height between 44 and 56 cm (17,32 – 22 inches). 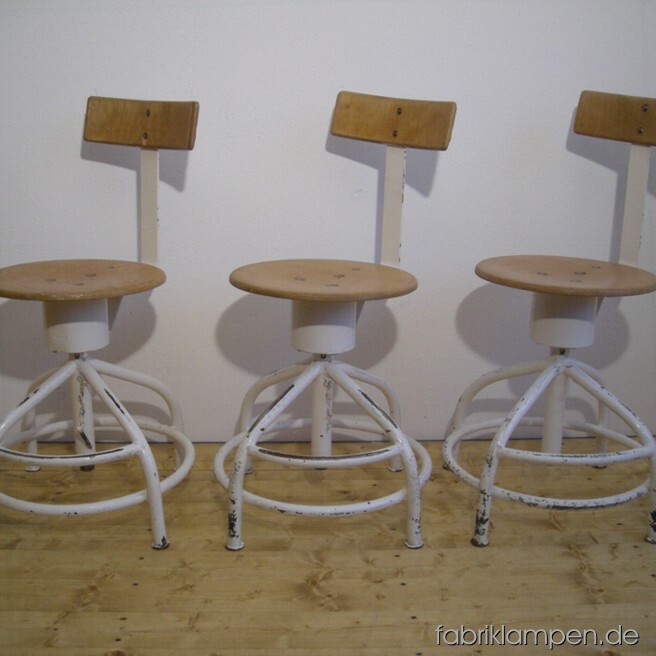 Old medical chairs (revolving chairs) in nice condition. Diameter sits ca. 33,5 cm (13,2 inches), sitting height between 46 and 67 cm (18,1 – 36,4 inches). 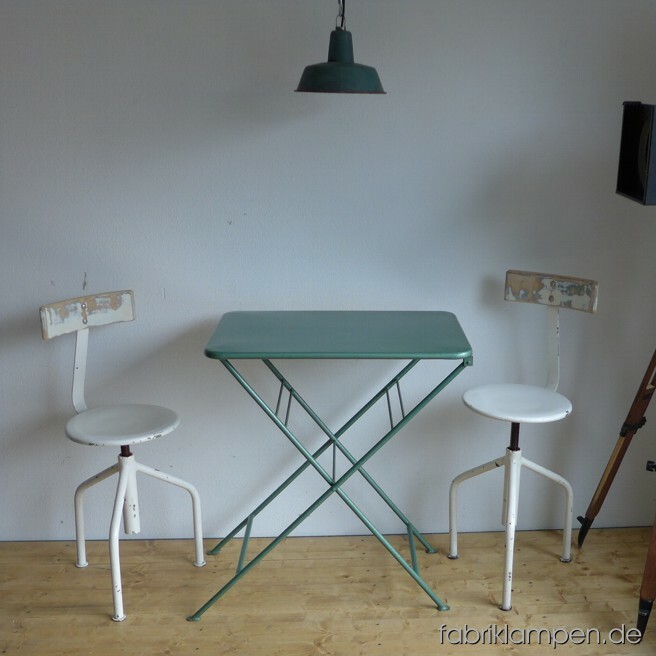 Old green metal tables in very nice original condition. Table surface ca. 73 x 52 cm (28,7 x 20,5 inches), height ca. 82 cm (32,3 inches). 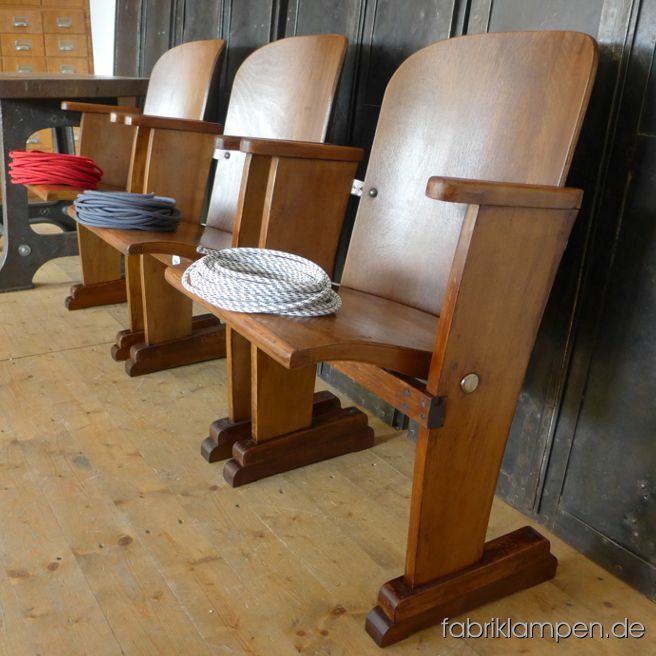 Old cinema chairs in very nice condition, made of oak and plywood. Width 106 cm (42 inches), height 83 cm (33 inches), sitting height 40-46 cm (16-18 inches). 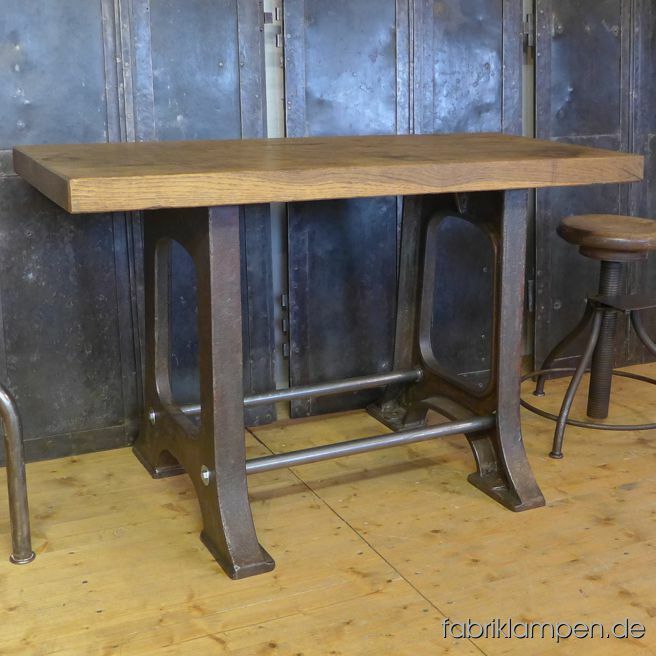 Industrial table made of an original industrial pedestal. The casted iron pedestal is cleaned and transparent varnished. The table surface is made of rustically oak (70 x 80 x 4,5 cm) and finished with natural hard oil. Height 84-85 cm. Weight ca. 45 kgs. 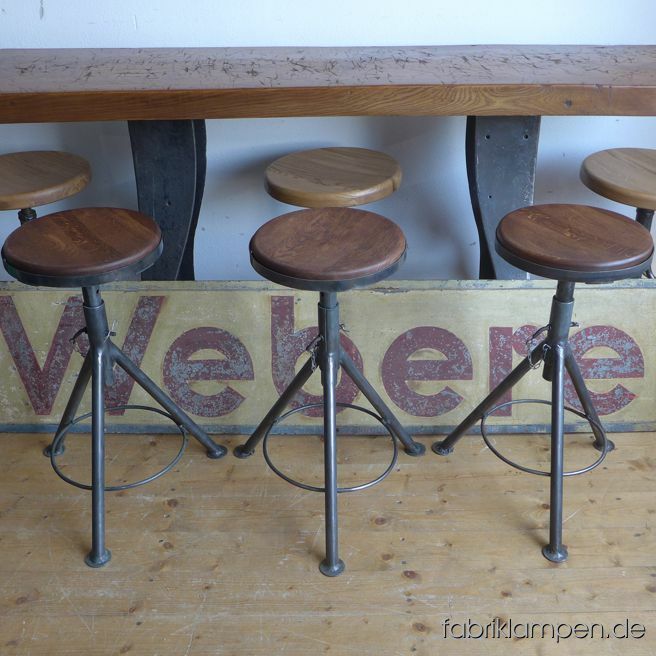 Industrial table made of an original industrial pedestal. The casted iron pedestal with original color is cleaned and transparent varnished. The table surface is made of rustically oak (70 x 80 x 4,5 cm) and finished with natural hard oil. Height 84-85 cm, weight ca. 45 kgs. 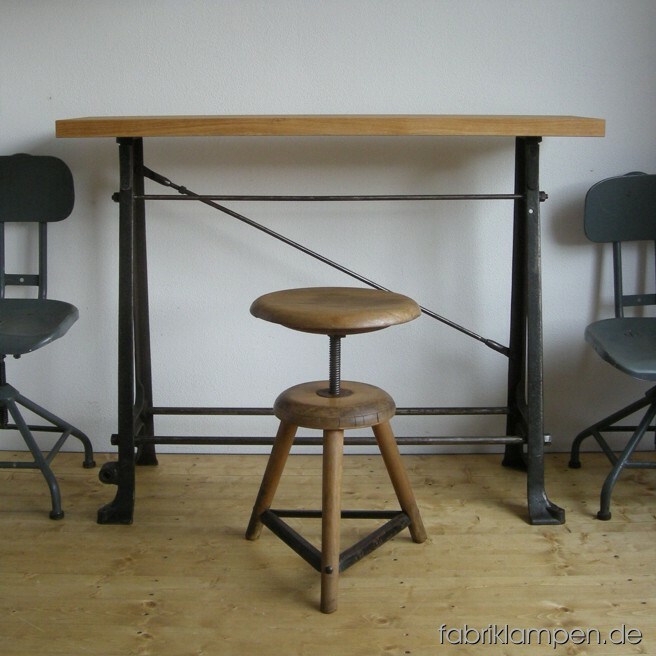 Industrial table made of an original industrial pedestal. The casted iron pedestal is cleaned and transparent varnished. The table surface is made of rustically oak (65 x 65 x 4,5 cm) and finished with natural hard oil. Height 78 cm, weight ca. 42 kgs. 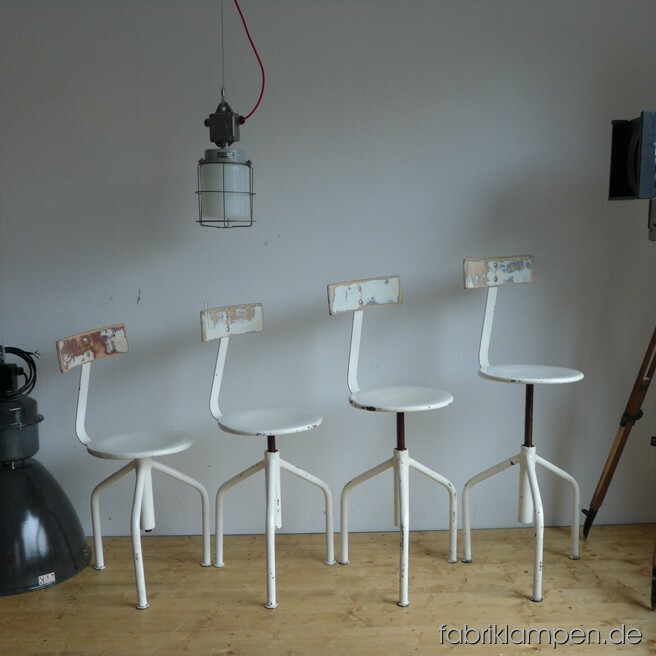 Old medical chairs (revolving chairs) in nice condition. Diameter sits ca. 38 cm, sitting height between 52 and 69 cm. 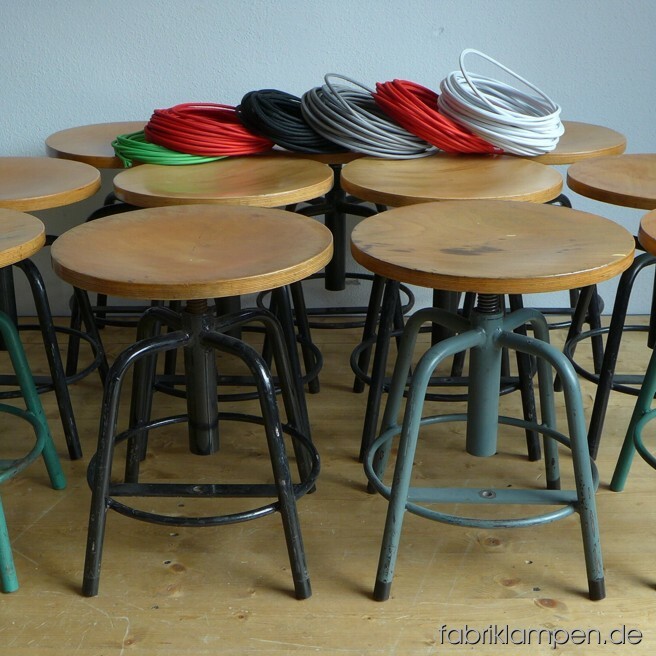 Industrial stools in restored nice condition. They are hand-cleaned and waxed. Diameter sits ca. 35 cm, sitting height between 47 and 79 cm (2 various types). 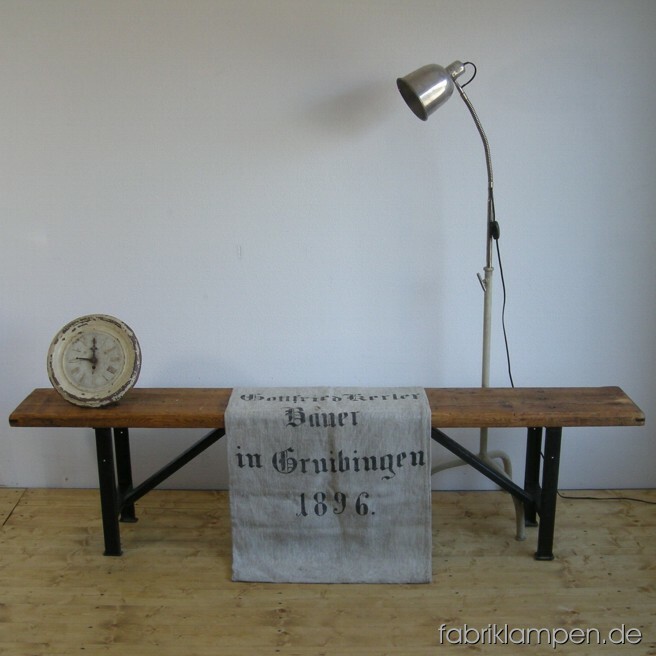 6 industrial benches in very nice shabby condition. The benches are cleaned and with hard-oil finished. Length ca. 190 cm, sitting height ca 48 cm, width ca. 30 cm. 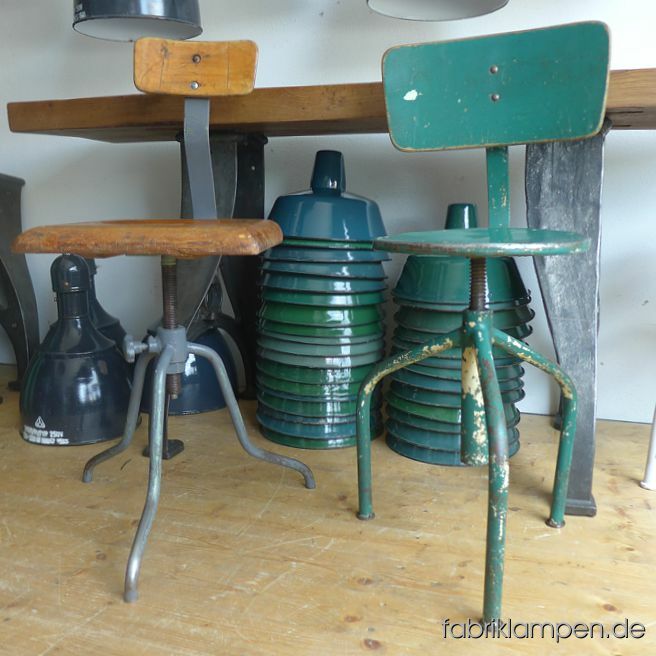 We have 3 benches with angular shaped pedestals and 3 benches with round green pedestals on stock. 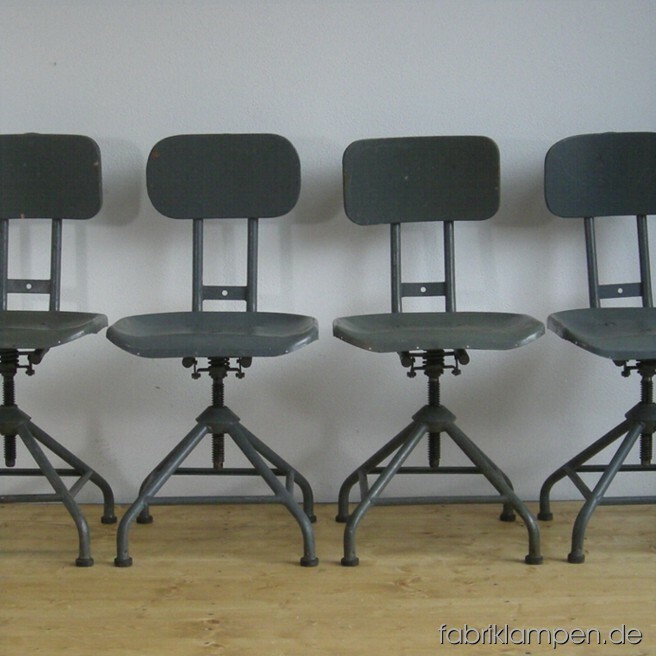 4 industrial revolving chairs in very nice condition. 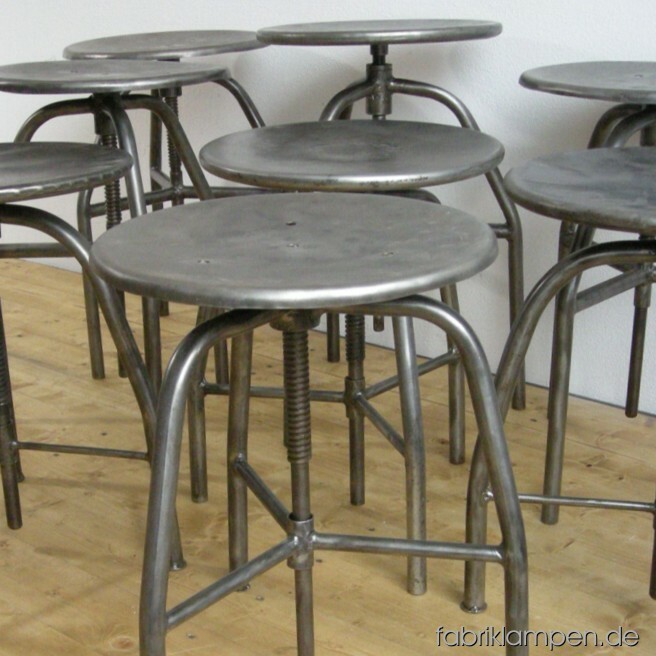 Sitting height between 41 and 51 cm, the sits are made of metal sheet, with spring-mounted backrests. 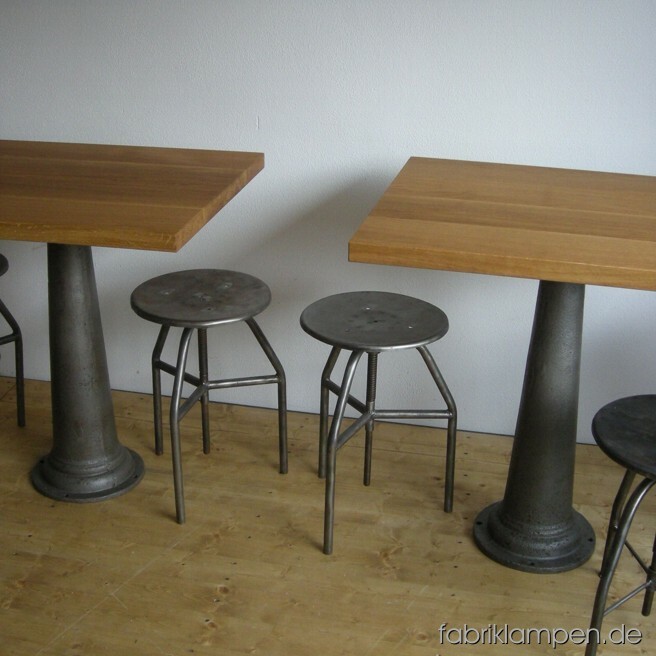 Industrial table made of an original industrial pedestal. The casted iron pedestal is cleaned and waxed. The table surface is made of rustically oak (125 x 34 x 4,5 cm) and finished with natural hard oil. Height 94,5 cm. 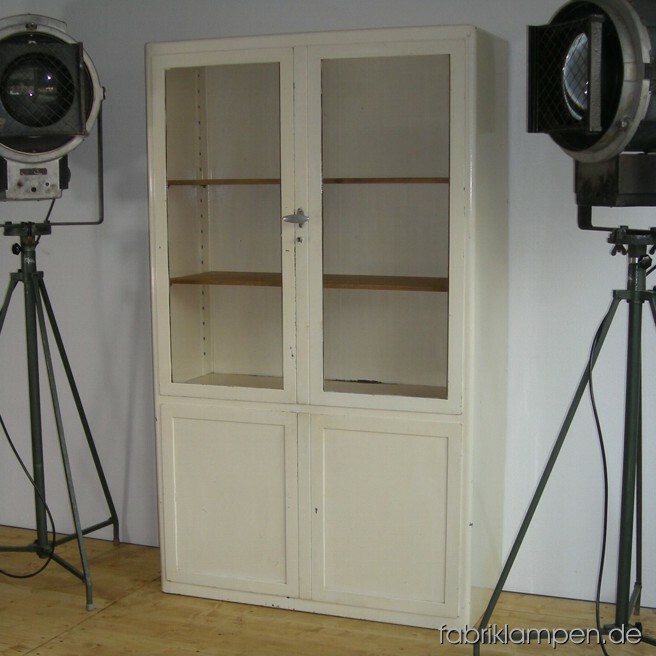 Old medical cabinet in nice shabby condition with wooden racks. Width ca. 100 cm (39,4 inches), height ca. 170 cm (70 inches). 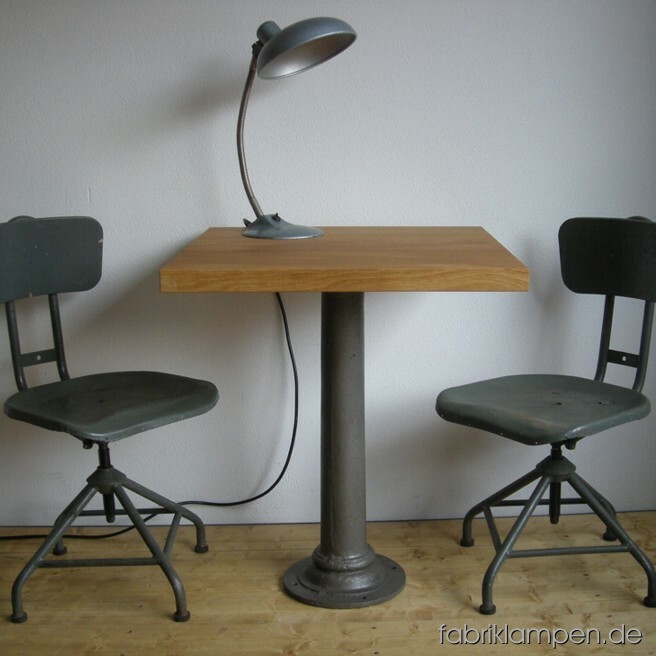 2 pieces old industrial chairs, the sits and backrests are renewed. Sitting height ca. 53 – 67 cm (21 – 26inches), diameter sits ca. 35 cm (13,8 inches).